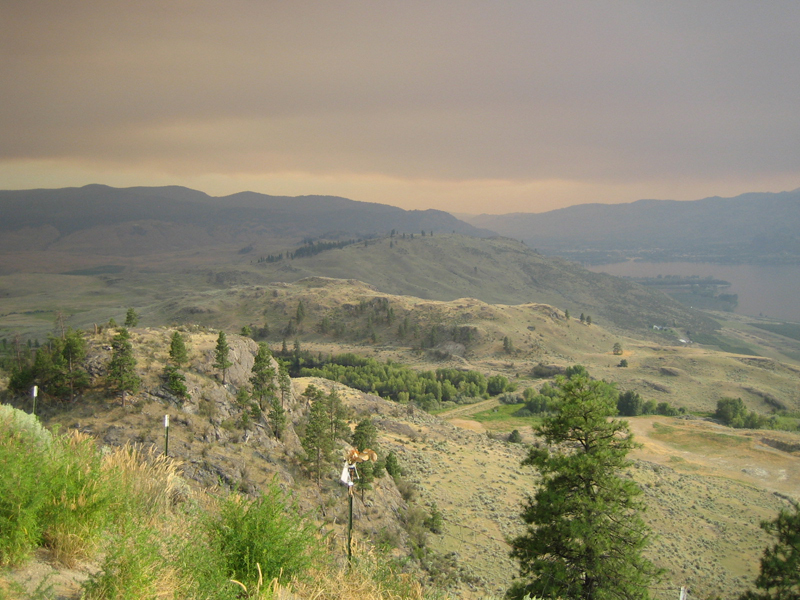 The photo was taken on top of Anarchist Mountain overlooking the Okanagan desert….and all the brown forest fire smoke coming across the Washington border. Our week-long camping trip was wonderful! We canoed on Slocan Lake, wandered around historic Greenwood, and dreamily made plans for the future. Ahhhh, I love summer roadtrips and get-aways! The food was amazing as well. The vegetarian cashew chili I prepared the first night was delicious and the left-overs made an amazing burrito dinner the second evening. Over the course of the week, we had amazing barbequed corn on the cob, roasted potatoes, delicious nectarines, and the best sandwiches from the Frog Mountain Cafe in Cresent Valley. Yum! Back in Vancouver, I made sure to start our return to civilization on the right foot with a freshly baked batch of peach and vanilla scones for breakfast. The turned out deliciously and were great served with cold butter and a bit of cinnamon honey from the Okanagan. 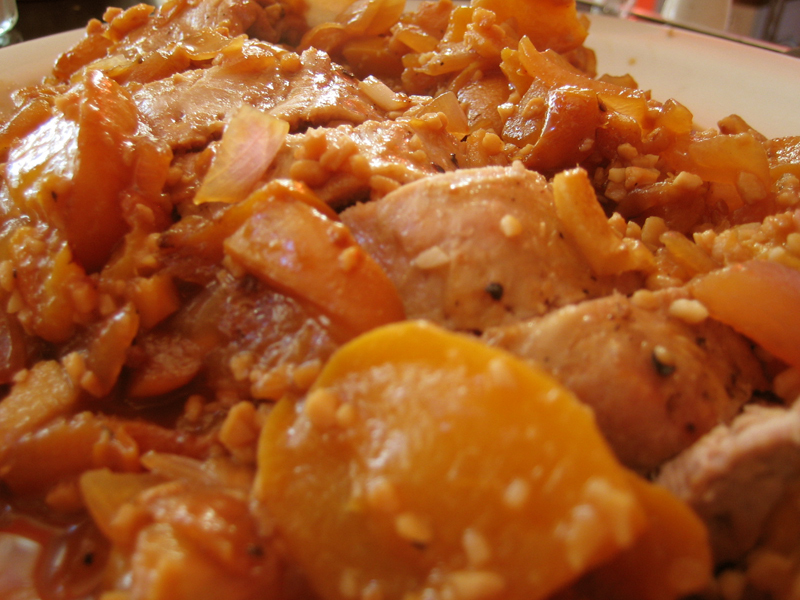 To carry on with the peach theme, dinner was a super-tender pork tenderloin roasted with peaches and ginger. As much as I love travelling, I sure do enjoy the comforts of home! 2. In a large bowl, combine the flour, baking powder, salt and sugar. Add the butter. With your hands, combine the flour and butter together until mixture is crumbly and the butter pieces are no larger than peas. 3. Add the vanilla extract, yogurt, milk and peaches and stir into the flour mixture with a wooden spoon. When the mixture comes together, knead the dough a few times, and then flatten dough into a disc about half an inch thick. Cut into 8 pieces, place on a cookie sheet. Bake for 10-15 minutes, or until golden. Cool on a wire rack. 1. Heat oven to 450 F.
2. Sprinkle salt & pepper over the pork tenderloin. The secret to a tender roast is to sear the meat, so this step is very important! In a heavy cast iron pot, heat the olive oil and sear the meat on all sides. Turn off heat. 3. Add the peaches and onion to the pot. Pour the remaining ingredients over top and mix with a wooden spoon. Cover the pot and place into hot oven for about 30 minutes or so. Remove lid and continue cooking for another 15 minutes before removing from oven. Slice and serve. My husband has just gone vegetarian and I will really try that chili. I have nothing to cook for him! The peaches all look scrumtious in those dishes. Yum! I simply love peaches. I can’t wait to try the scones! I printed off the recipe and will try hopefully tonight so I will have a yummy breakfast to bring with me to work in the morning. Yum and Thanks!!! I never knew there was an Anarchist Mountain. Ellie, summer fruits are the best! I fell in love with nectarines on our trip but had an abundance of peaches back home. Judy, that chili is pretty fantastic. There’s lots of great vegetarian stuff out there. Good luck. Thanks Molly, it was a dreamy-filled week. And what a better way to end the good stuff than with peaches! Rachel, I hope the scones work out! 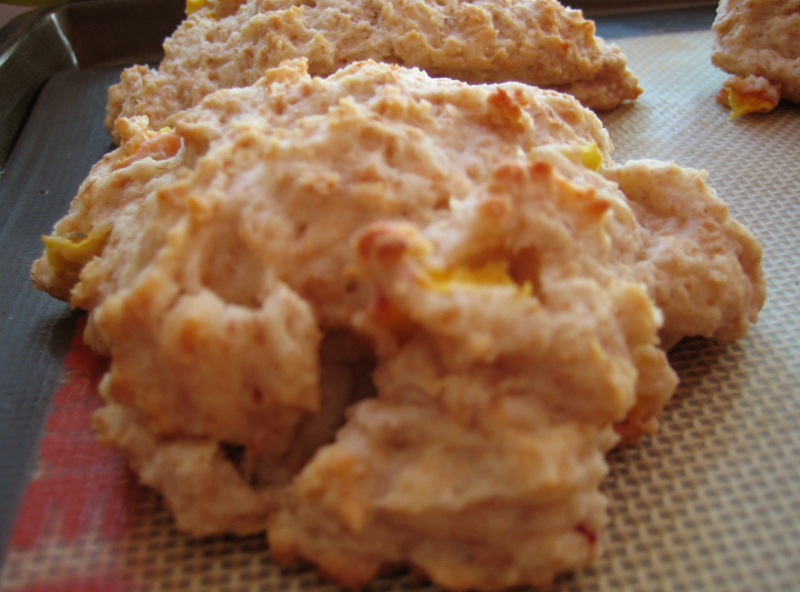 The recipe yeilds a stickier unbaked scone than usual, but it all worked out in the end. Thanks Jenn, the peaches were lovely in those recipes! Joseph, its a funny history on the name of that mountain. Some maps have it as “Anarchist” and some have it as “Anachist”. I just found your site, and I must say that those scones look incredible! I’ve driven and walked by that restaurant many times. Next time I visit Crescent Valley I’ll be sure to go. It just seems kinda small and cramped. Did you go down the slocan river on a tube? That’s on my list of things to do before…you know. I had the most amazing veggie sausage rolls from a bakery just north of Winlaw. But this last year everytime I pass that way it’s a Monday and they’re closed. I really miss the golfing in Winlaw. finallyfifty, it’s definitely a nice place to stop. we ate our meals under a tree in their backyard and loved it! we went down the smilkimeen river in a tube. much fun!! i love that area.